Discover a different type of luxury in Sonoma County, the perfect destination for travelers who want to immerse and connect — with the earth, with nature, or, most importantly, with each other. Whether it’s a romantic getaway for two, an unforgettable family vacation, or a gathering of friends, enjoy down-to-earth adventures while “glamping” in comfort and style about an hour north of San Francisco. 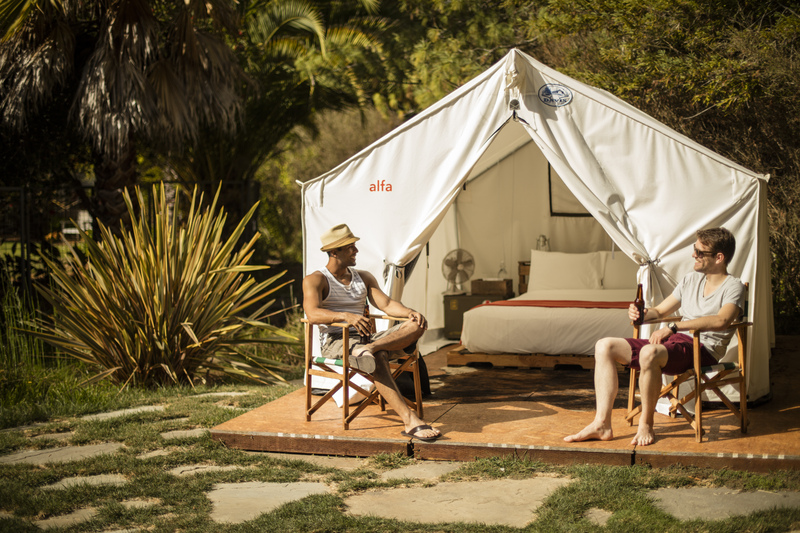 Think 800-count organic cotton sheets and plush décor in a stylish platform tent or classic trailer. Throw in ancient redwoods. The majestic Pacific Ocean. The winding Russian River. Acres of rolling vineyards. 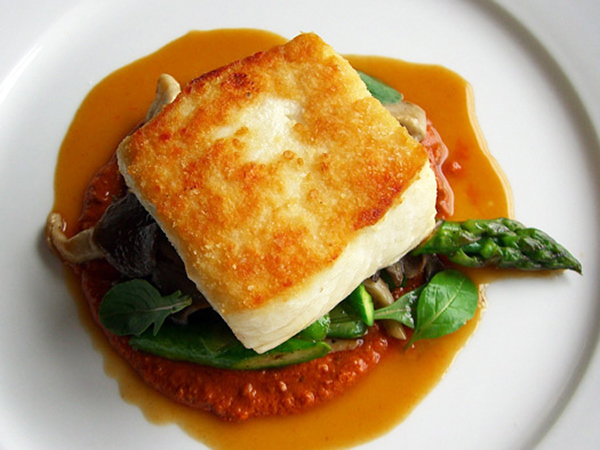 Farm-to-table cuisine. Fine wines. Craft beers. Charming small towns. Everything you need for a memorable visit to Sonoma County. 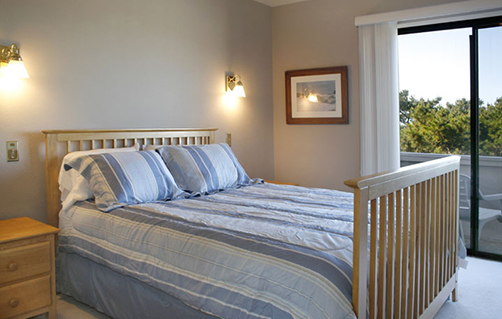 Here’s a quick overview of some of Sonoma County’s glamorous camping opportunities, so you can create the itinerary that’s perfect for you. Choose between a custom-designed Airstream trailer (with that instantly-recognizable “silver bullet” shape) or a spacious canvas tent with a plush interior at this gorgeous modern “campground” under soaring redwoods trees in the Russian River town of Gureneville. Meander the winding pathways on this unique property, play lawn games, or relax in the midcentury-modern clubhouse. Use the s’mores kit to create campfire memories. Not far away you’ll find Porter-Bass Winery, where owner Luke Bass crafts highly acclaimed wines that are available only in Guerneville. His 1,000-case winery and cellar is built into the side of the earth. The tasting bar is a slab of wood resting on two barrels underneath a walnut tree, on a gentle slope overlooking breathtaking views of vineyards and forest. 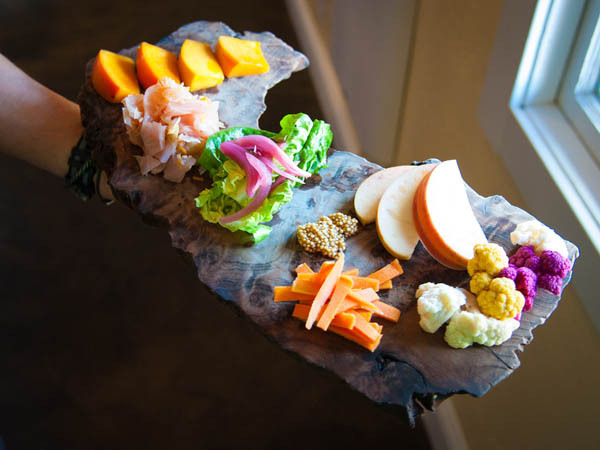 In the nearby town of Forestville, chefs Daniel Kedan and Marianna Gardenhire work closely with local ranchers, orchards, farms, creameries, and foragers, visiting often to see what’s best, and then dreaming up new recipes for their Backyard restaurant. This simple roadhouse with garden seating offers what appears to be a modest if changing seasonal menu — but oh my, the flavor. 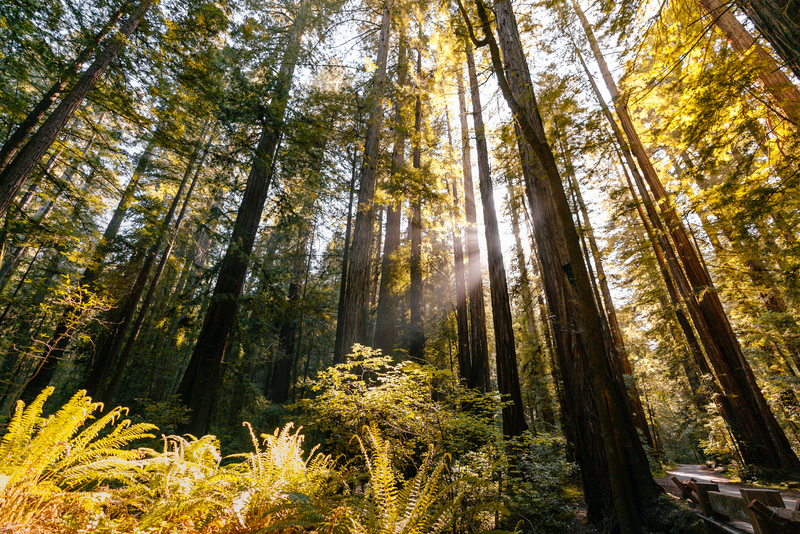 Stroll under majestic towering trees at Armstrong Redwoods State Natural Reserve (or take a guided gliding tour through the park with Segway of Healdsburg). Then fly through a redwood canopy on zip lines at Sonoma Canopy Tours. Or hop onto one of Autocamp’s fleet of bicycles, and pedal through town, discovering the shops and restaurants along Main Street. If you’re feeling ambitious, explore the West County Trail, a paved pathway from Forestville to Sebastopol. In addition to 14 former miners’ cabins converted into modern luxury accommodations by founder Christa Luedtke (who many credit with spearheading Guerneville’s most recent renaissance), this unique lodging place offers deluxe platform tents from Memorial Day to the end of September, and a vintage “lovebug” camper that’s available year round. These glamping options include platform beds, organic linens, and a terrific breakfast. A 1921 bank building in downtown Guerneville (now known as the Guerneville Bank Club) includes the tasting room for Inizi Wines. Founded by four friends — A.J. and Jen Filipelli and John and Kirsti Harley — Inizi (which means “beginnings” in Italian) produces an eclectic mix of Italian and regional French styles: a Sangiovese blend, a rare Tocai Friulano (an Italian white grape), and the very rare, typically deeply hued but food-friendly red varietal Charbono. 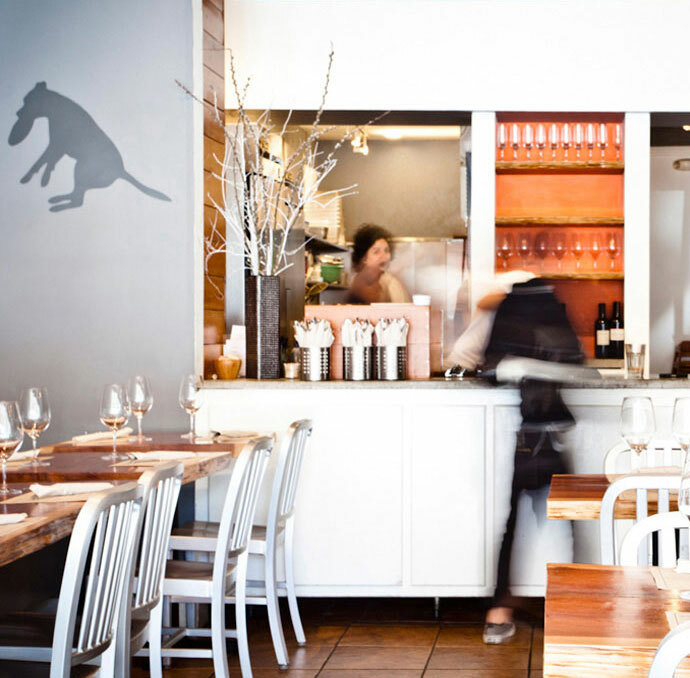 Hotel owner Christa Luedtke is also the chef at her modern California bistro, Boon Eat + Drink. (Her “boon” businesses are named after her dog.) This urban-chic restaurant offers two dozens seats and seasonal menus featuring local ingredients. 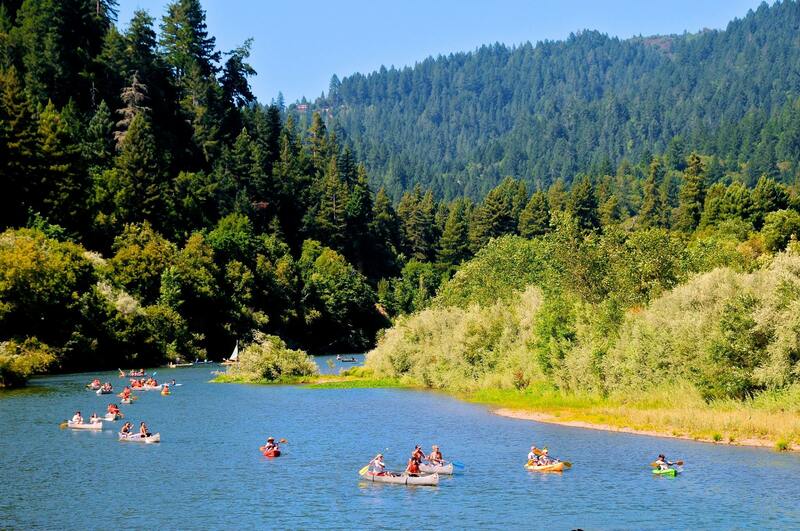 Paddle leisurely down the Russian River on a 10-mile self-guided canoe or kayak trip with Burke’s Canoe Trips, or take to the river on a standup paddleboard from SUP Odyssey. Or splash and play at Johnson’s Beach, a favorite family summertime destination for more than 100 years. Luxuriate in 600-thread count Egyptian cotton sheets, down comforters, and queen-size beds in platform tents set on redwood decks at this working ranch that is also a 400-acre nature preserve in the hills above Bodega Bay. There’s also “The Kerri,” a plush Airstream trailer that sleeps four, with views of the Pacific Ocean. Or sleep in a rustic tipi in the ranch’s Miwok Tipi Village. Go horseback riding along the beach or on trails with incredible hilltop views, take a guided nature walk, or go kayaking on Salmon Creek. Or just visit and relax with the ranch’s chickens, pigs, alpacas, and other animals. Go wine surfing with a flight served on a mini-surfboard at Gourmet Au Bay, a waterside wine bar and restaurant, where owner Brian Roth features an impressive collection of local wines hand-selected from Sonoma County wineries. At Terrapin Creek Café, owners/chefs Andrew Truong and wife Liya Lin have earned national acclaim for their seasonal menus using the finest, freshest ingredients in inventive pairings, in a casual, neighborly atmosphere. 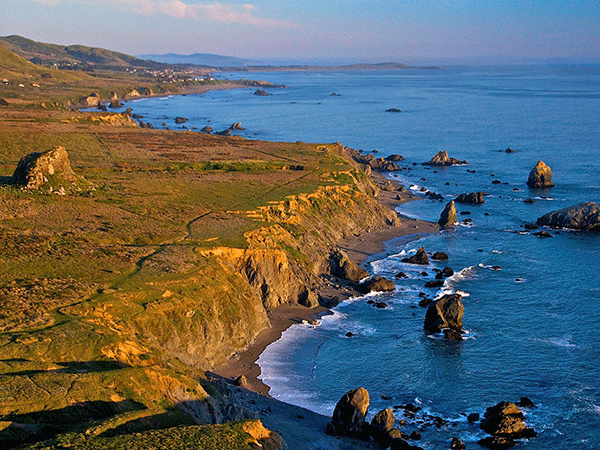 Explore Sonoma Coast State Park, stretching north from Bodega Bay for 17 miles with an amazing series of sandy beaches, hidden coves, and rocky bluffs. Take a customized guided kayak or stand up paddleboard trip with Bodega Bay Kayak. Watch for whales and seals at Bodega Head, or buy a kite at Second Wind or Candy & Kites and fly it on the two-mile-long beach at Doran Regional Park. Experience the Serengeti at Safari West Wildlife Preserve & African Tent Camp, a 400-acre preserve in eastern Santa Rosa that’s home to more than 800 exotic animals —zebras, cheetahs, antelopes, giraffes, wildebeests, and more. Owners Peter and Nancy Lang imported the park’s elegantly appointed safari tents from Africa. Ride in an open-air vehicle, watching the animals socialize, eat, and play, and then dine in the onsite Savannah Café and sleep in delicious luxury with African wildlife as your closest neighbors. Get that retro road-trip feeling at the Metro Hotel & Café — a 15-room self-serve-style boutique hotel with eclectic French charm in a 140-year-old-building near Petaluma’s historic downtown. 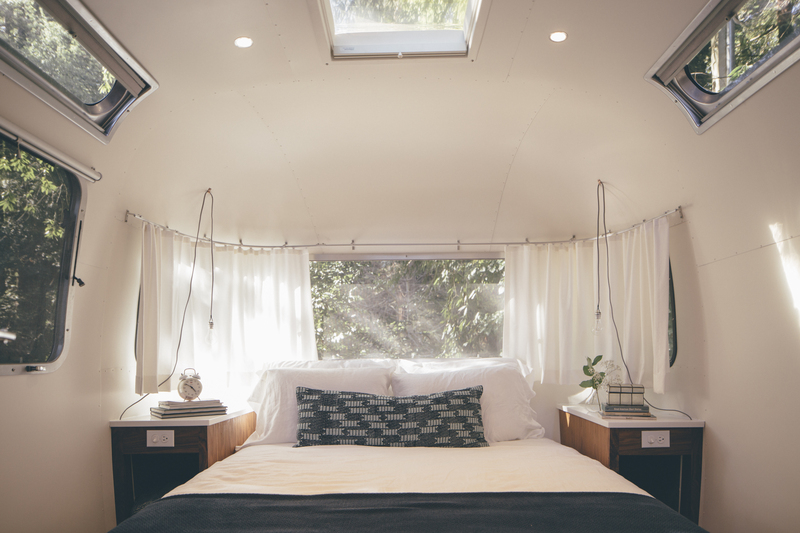 The Metro offers two Airstream trailers on its property, the 22-foot Airstream Bambi and the 28-foot Airstream Honeymoon Suite, both with maid service and complimentary organic coffee and crepes in the morning. Although it mostly caters to tent and RV campers, Casini Ranch Family Campground along the Russian River rents family cabins, cottages, and RV bunkhouses, and both Cloverdale Wine Country KOA Camping Resort and San Francisco North/Petaluma KOA Campground offer deluxe cabins and lodges.